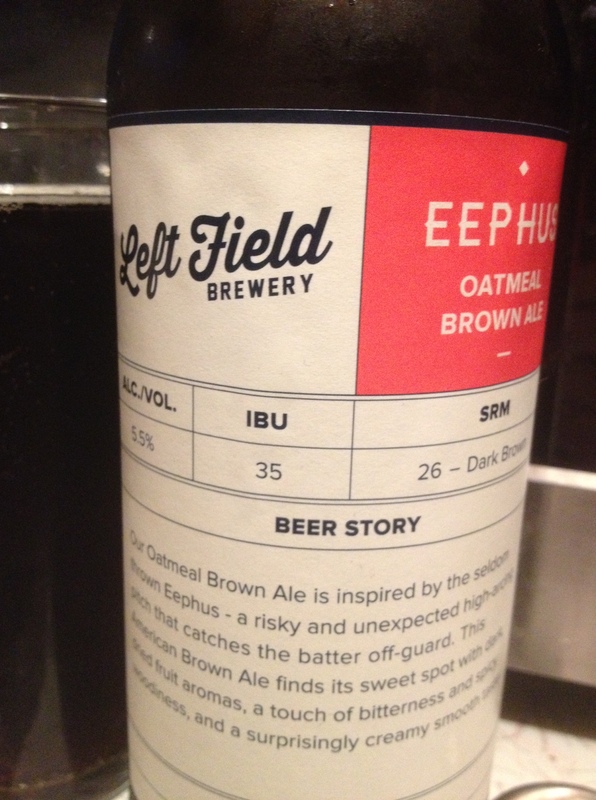 Left Field is a new brewery out of Toronto (though currently contracting out of Grand River Brewing in Cambridge). As you can probably guess from their name, they are Baseball themed, which goes well with baseball season arriving soon. Started by Niagara College brewing program graduate Mark Murphy and his wife Mandie, their first offering is Eephus Oatmeal Brown Ale. What is an Eephus? Well, it’s described as a “seldom-thrown and unexpected pitch”, usually at slow velocity (55mph, as opposed to a regular pitch, which is about 80-100mph), which throws the batter off guard. The arrival of the brewery comes at a good time, as not only is baseball season starting up here, but there’s also a renewal of interest in the game, since the Toronto Blue Jays went through some changes. For Toronto folk, they have a launch coming up April 5th at 3030 (3030 Dundas St. West) at 7:07pm. COLOUR: Dark brown. No head whatsoever. AROMA: Warm, earthy malt notes. TASTE: Nice caramel notes with a a slight bitterness all rounded out well with the creaminess of the oatmeal. Carbonation is pretty minimal and I feel like I’m missing out on things a bit there, as it’s tasting a bit flat. VERDICT: I’d drink this while spending a day in watching a game (bonus if it’s a particularly chilly and rainy day). All in all, it’s a pretty comfortable Brown Ale that is quite enjoyable! Nice site. Small correction – Grand River Brewery is in Cambridge, ON. Gah, why the hell did I say Geulph? Nice catch, Nick, thanks.